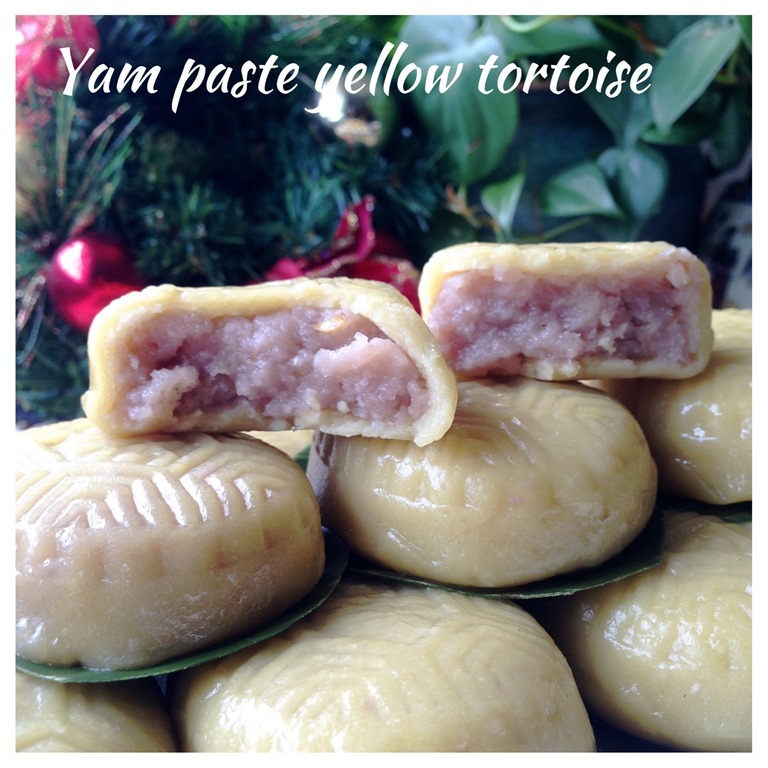 Have decided to update this post with another less common filling – Yam paste filling. 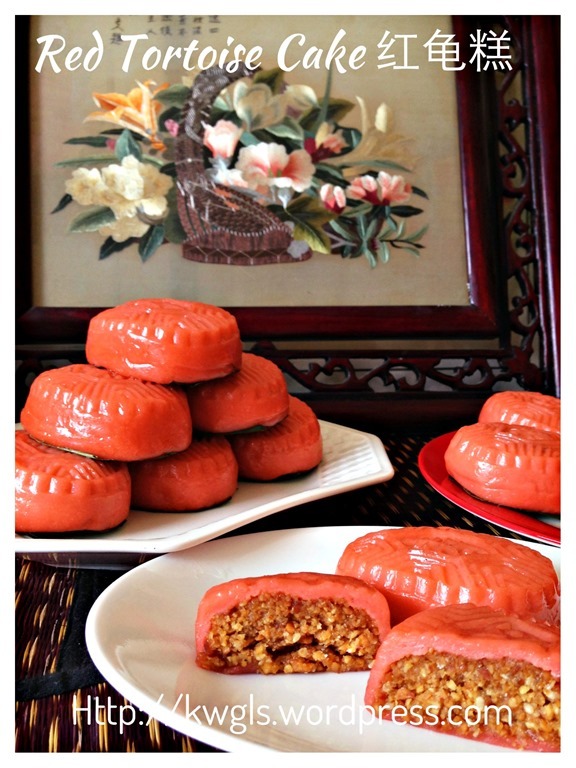 It is a type of filling that bring fond memories and angku kuih with this filling is not commonly sold in the stores. 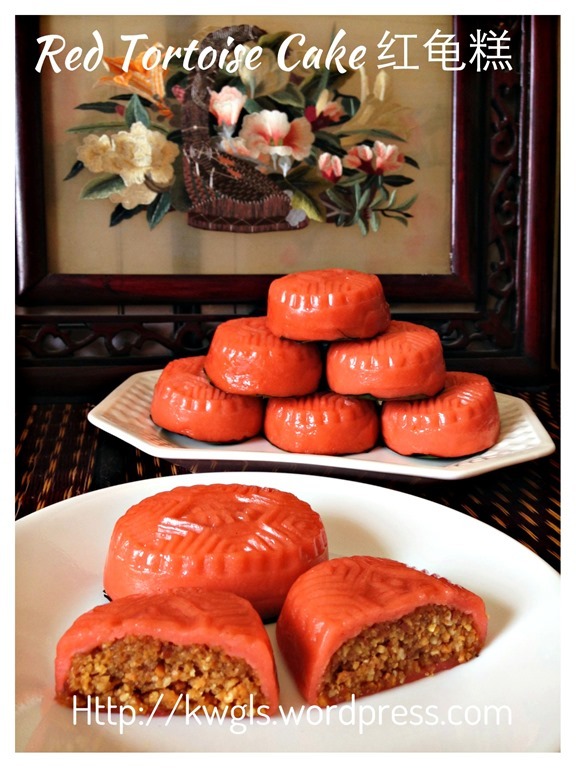 My late auntie used to prepare this for praying session together with other type fillings like savoury tausa fillings and sweet tausa fillings. 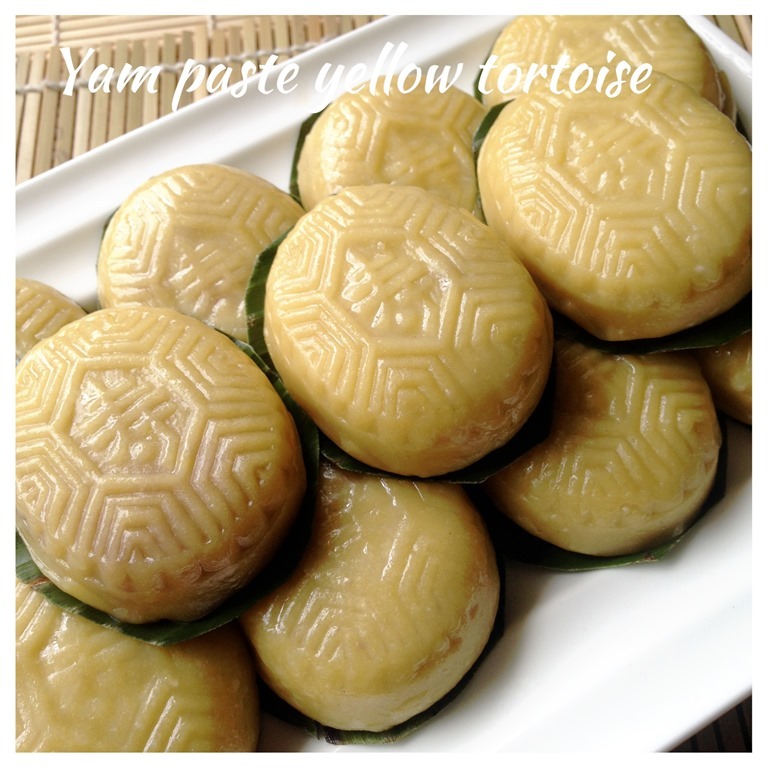 As for the skin, I have used yellow sweet potatoes without the use of red colouring. 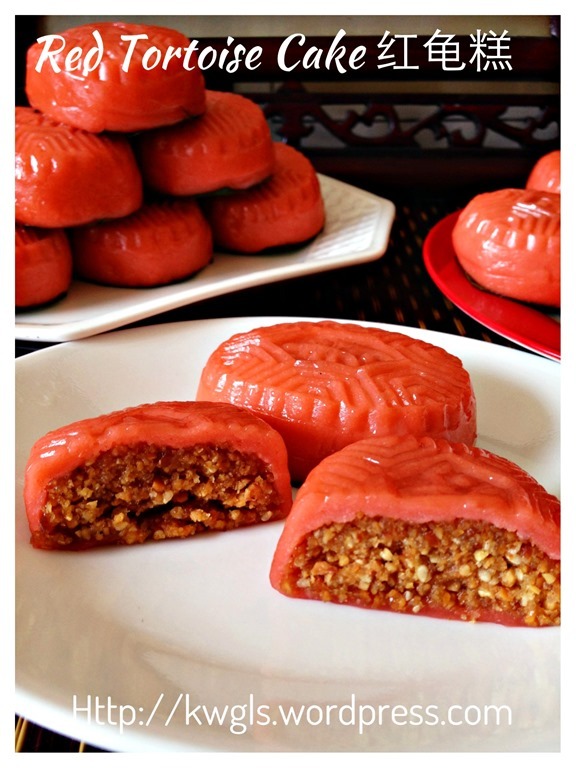 Hope this will benefit readers who are looking for this filling for angku kuih. 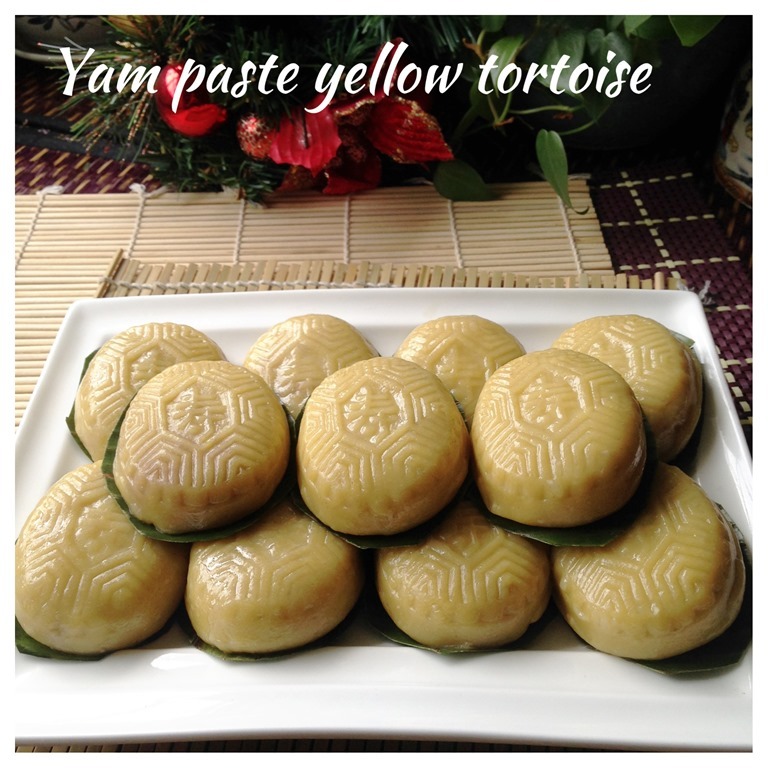 I have prepared some black tortoise kuih (黑龟糕） on March 19, 2014 prepared using mugwort dough (艾叶） and with a savoury mung beans fillings （咸香豆沙）. 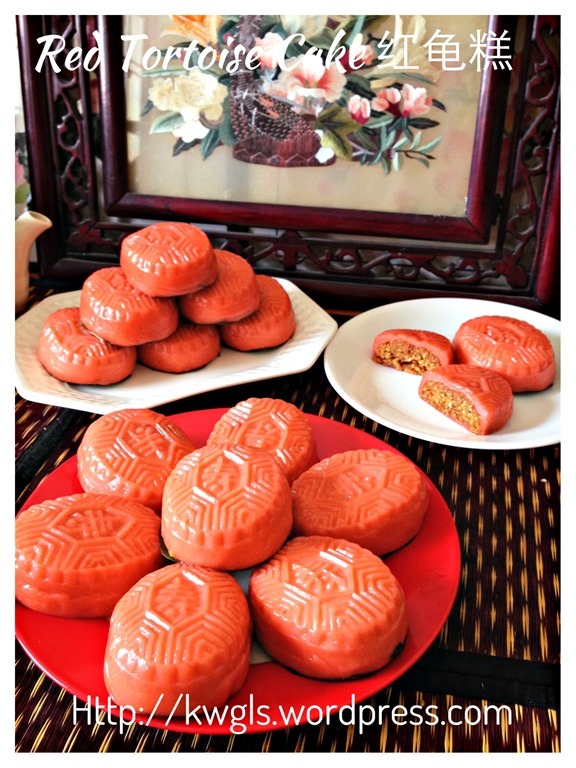 Since then, I have not prepared any using the wooden tortoise mould that I have..
“Red tortoise cake (Chinese: 紅龜粿; Pe̍h-ōe-jī: Âng-Ku-Kóe) is a small round or oval shaped Chinese pastry with soft sticky glutinous rice flour skin wrapped around a sweet filling in the centre. 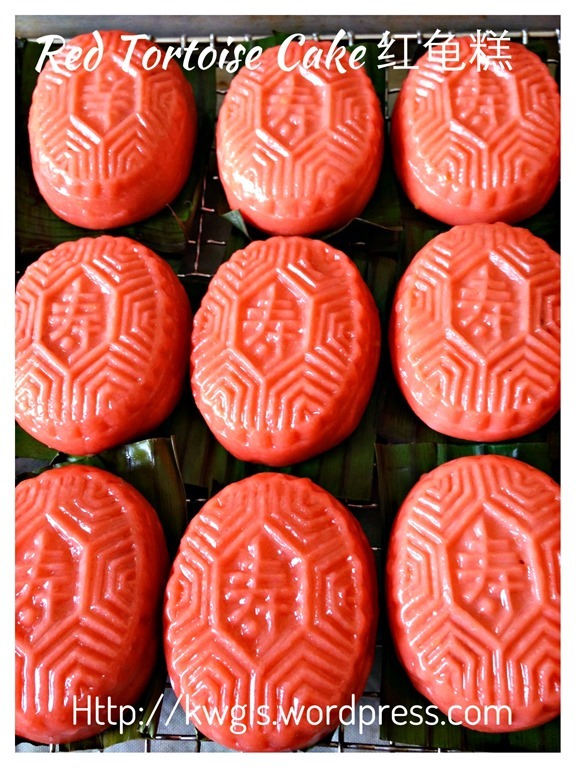 It is molded to resemble a tortoise shell and is presented resting on a square piece of banana leaf. 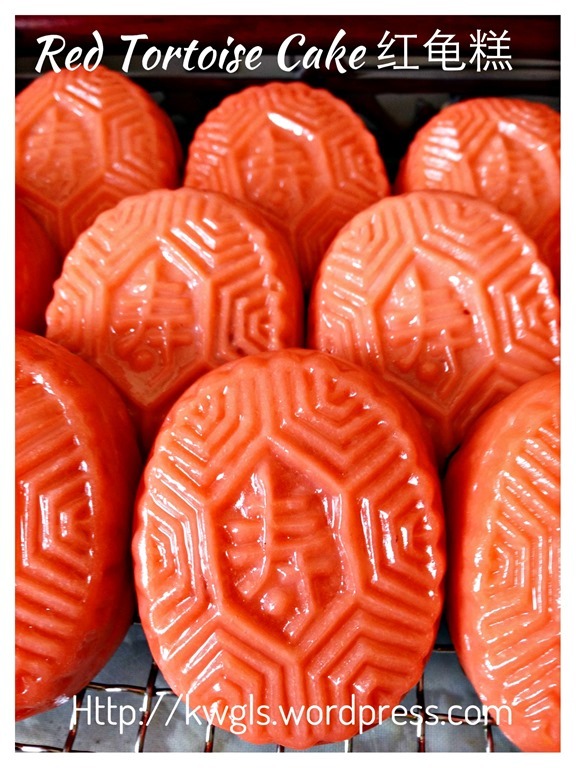 As suggested by its name, red tortoise cakes are traditionally red in color and has a sticky chewy texture when eaten.Red tortoise cakes are shaped like tortoise shells because the Chinese traditionally believed that eating tortoises would bring longevity to those who are eating it and bring about good fortune and prosperity. 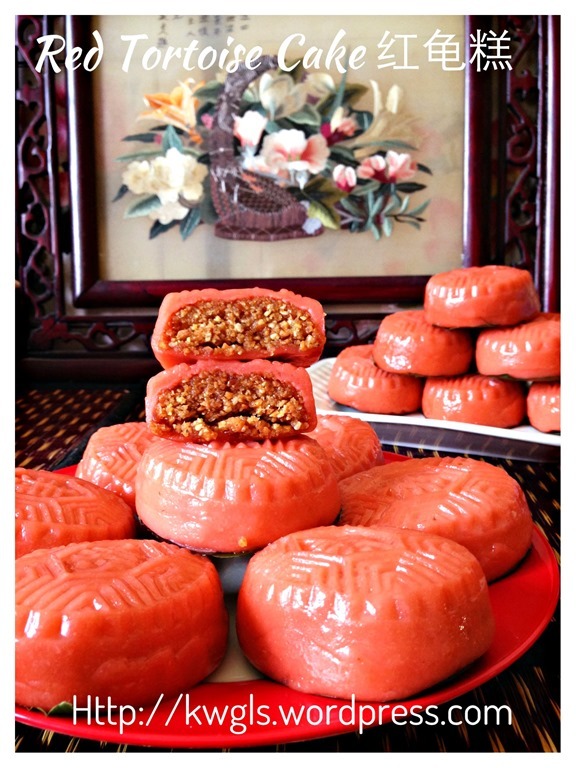 Considered to be auspicious items, these sweet pastries are especially prepared during important festivals such as Chinese New Year as offerings to the Chinese deities. 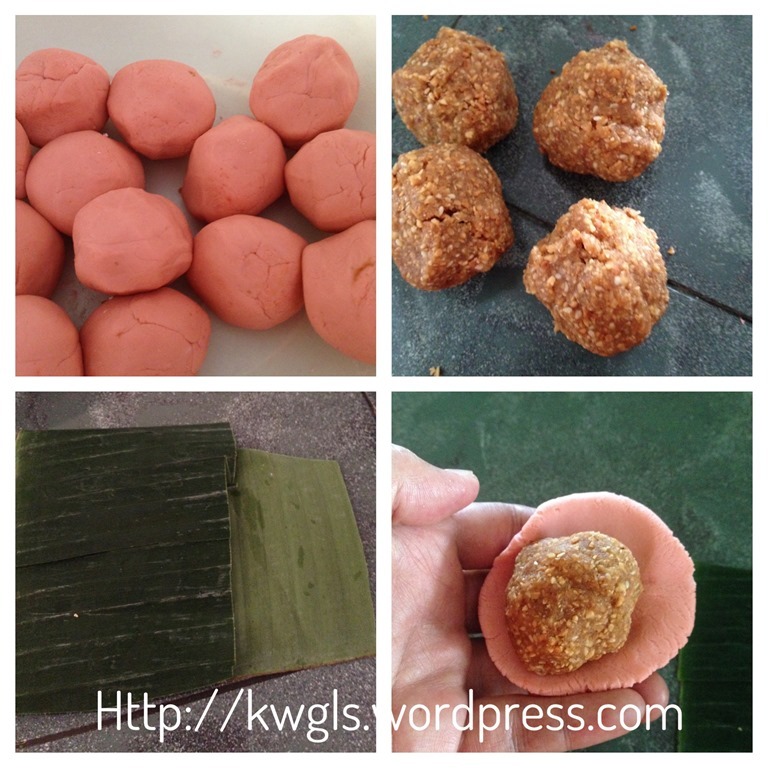 Out of the different type of fillings, I loved shredded coconut filling and groundnuts filling rather than mung bean fillings. I have shelved the idea of using coconut fillings as it can turn bad rather easily in this hot weather. 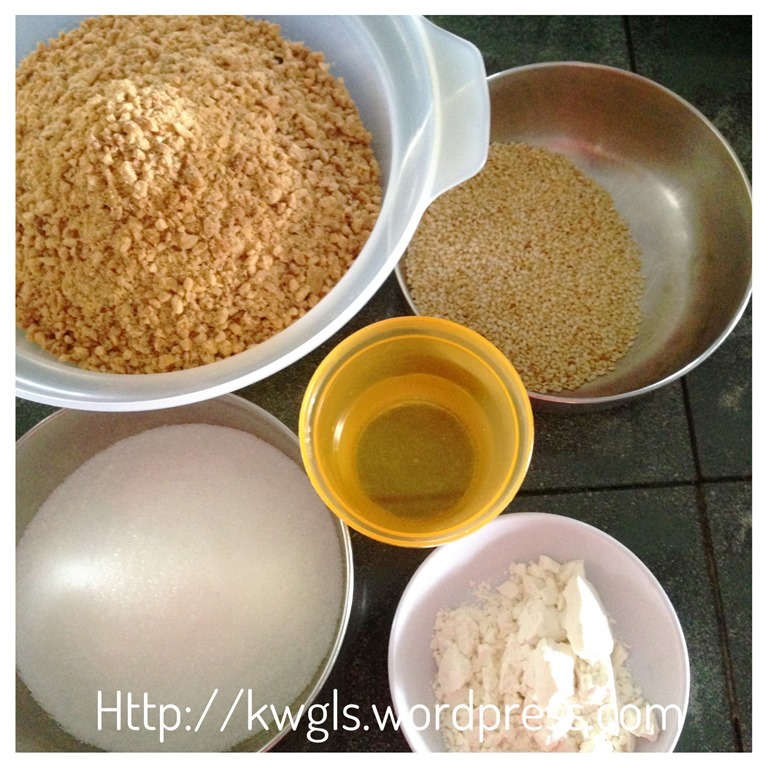 I have therefore decided to prepare the steamed cake using grounded peanut. I especially love the aromatic, crunchy sweet flavour of the grounded peanuts. After reading many recipes, I have come out with my own recipe and I am very happy that it works, easy to mould and the cooked crust is much softer than my previous attempts. I am happy with the cake except the colour of the cake which should be at least one shade darker than my colour… Hmmm, playing with colour really needs experience and obviously, I am not good at this.. haha. Put few drops of permitted red colouring into the hot water, stir until well mixed and set aside. 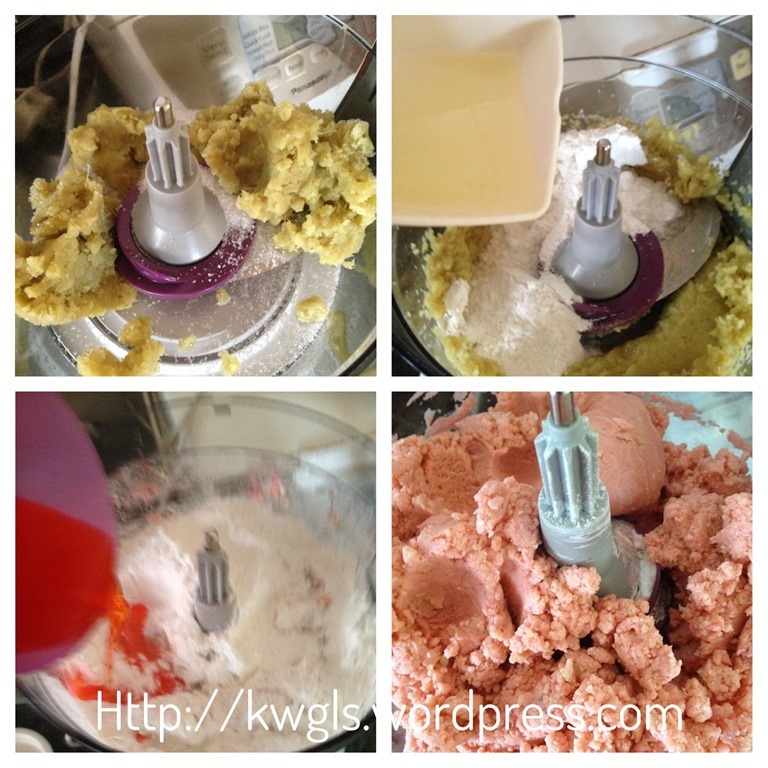 Put the mashed potatoes and sugar in the food processor and cooking oil, blend until fine. 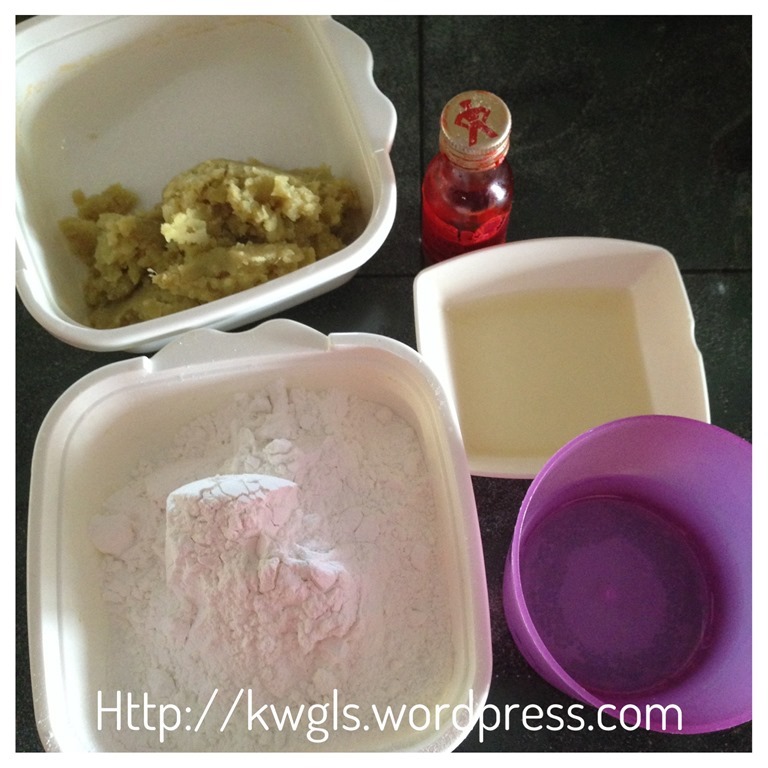 Add in the glutinous rice flour and red hot water in 3 stages, blend until well combined. Set aside the dough and divide into 15 equal balls of about 40 grams each. Cover with a piece of damp cloth to prevent moisture loss. I have decided to use the food processor because my mash potatoes are very rough and difficult to mash manually. Using food processor is optional and you can always manually mash the potatoes and knead the dough. The amount of water will very much depends on how wet is your mashed potatoes. If your dough is too wet, add glutinous rice flour tablespoon by tablespoon and if it is too dry, add cold water teaspoon by teaspoon. 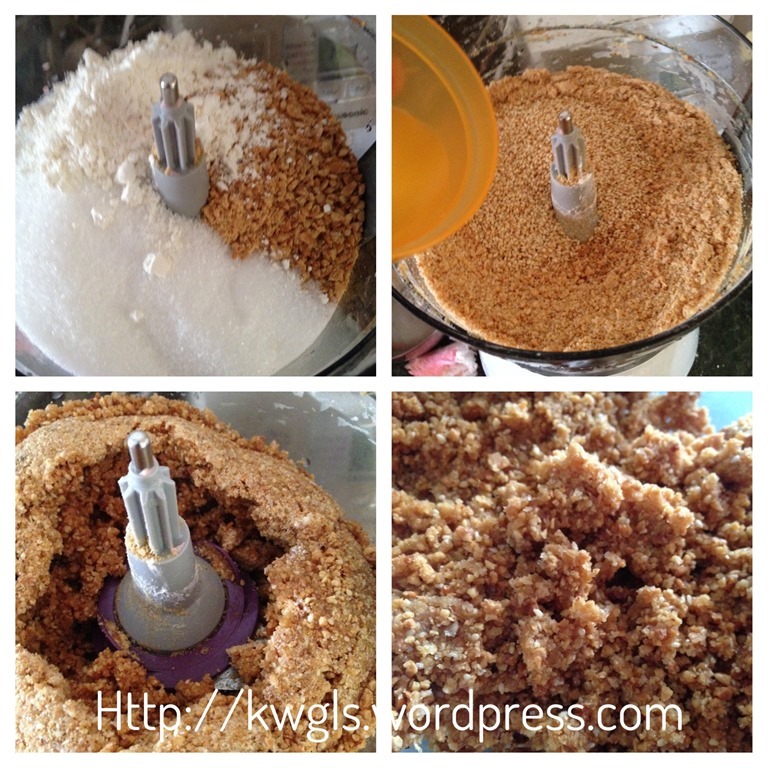 In the same food processor, place the flour, grounded peanuts, peanut oil and castor sugar and blend until your desired size. Add water gradually in 3 stages until it form a firm dough. Transfer out and divide into 15 equal balls (about 35 grams each). Note that using the food processor is optional. However, as the grounded peanut that I bought is very coarse, I have resorted to the use of food processor to expedite the preparation. You can always do this manually. Steam the cut yam or taro until soft. It will take about 15 minutes but it also depends on your yam quality. Some are harder to steam than the others. 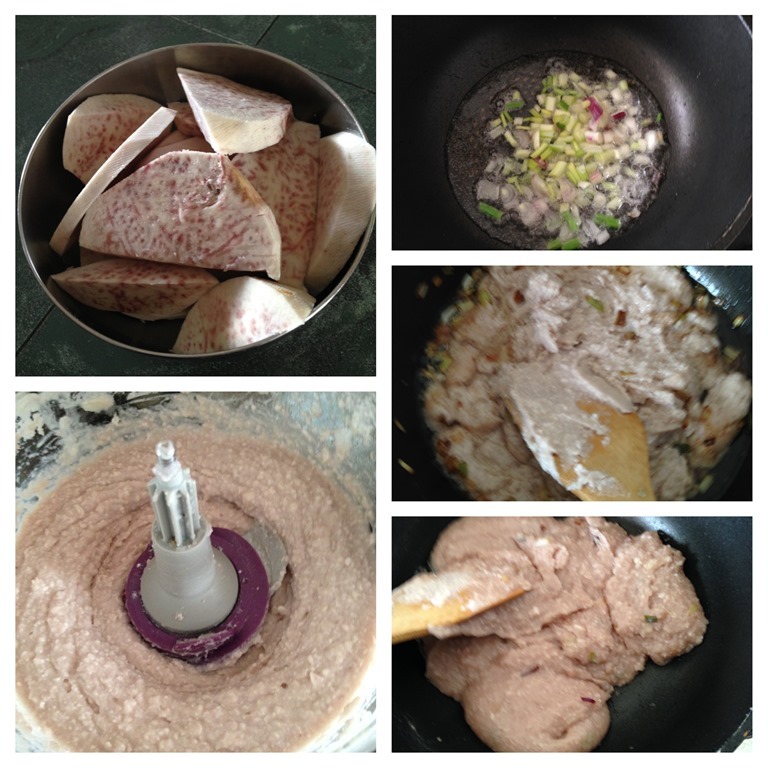 While the steamed yam is still hot, transfer to a food processor and blend until smooth. In a frying pan, put the cooking oil and sauté the spring onion until fragrant. Add the yam paste and sugar and stir fry the yam paste until well combined and become drier. Cool completely before wrapping. 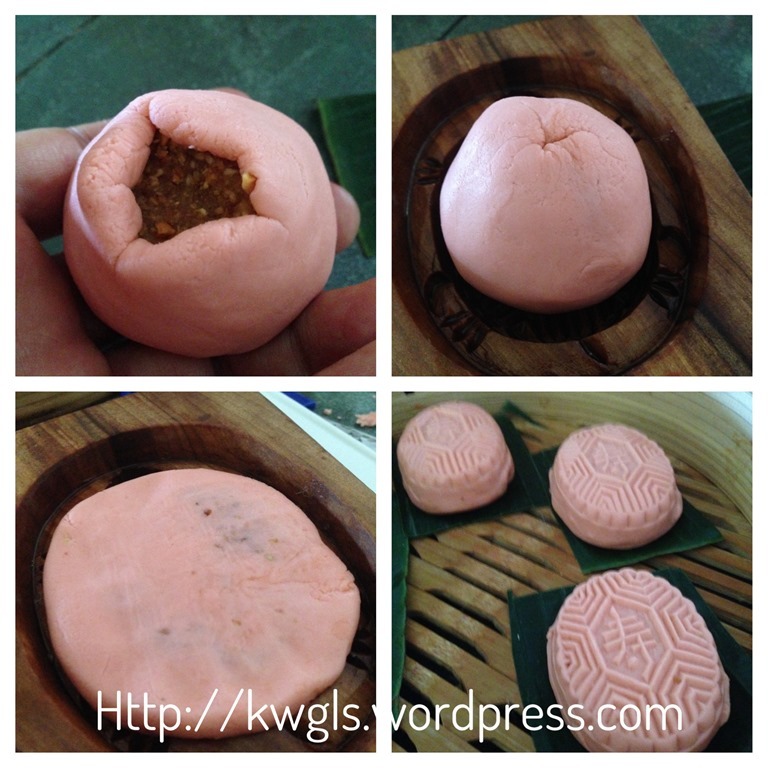 For assembly, take a dough, shape round, flatten it, place on top of a dough a ball of peanut filling. 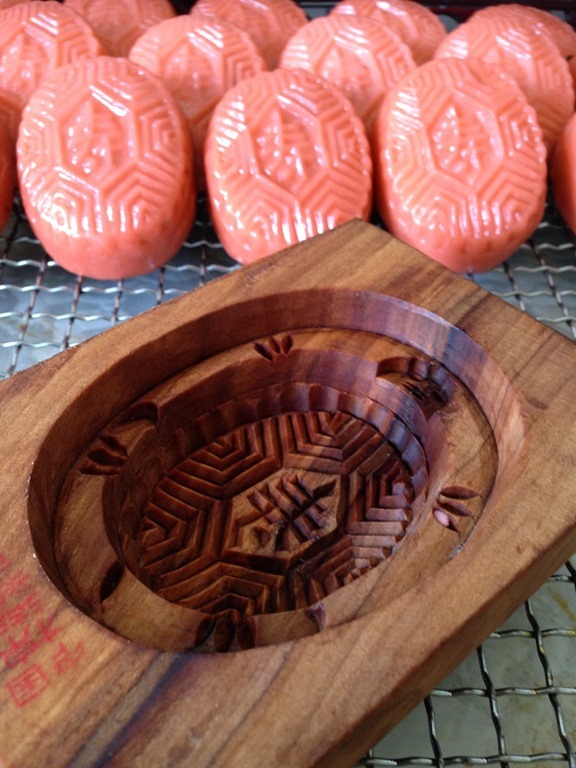 Seal the edges, shape round and place on top of your angku mould. Press down firmly and dislodge the cake by knocking the mould on the table. Put the cake in a piece of the cut banana leaves. Transfer to the steamer tray. Perform the same for the remaining 14 dough. Bring the water in the steamer to boil. 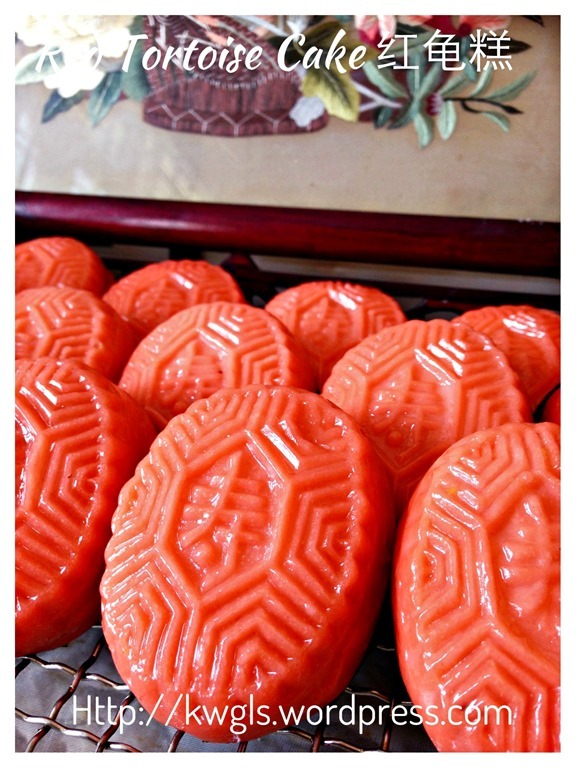 Once boiling, transfer the steamer tray to the steamer, REDUCE THE HEAT TO LOW and steam for 5 minutes. After 5 minutes, open the cover, lightly wash the cake with some cooking oil (to prevent sticking), and continue to steam the cake for another 5-7 minutes. This is not a difficult recipe to do with the food processor. But I have to highlight to all that the dough to filling ratio is for your reference. It will vary between mould and you have to trial and error to get the right ratio. My general ratio of dough to filling is 1:1 to 1:5:1, find one that is comfortable to you. One member of the Facebook Group highlighted that she had tried using beet root juice to colour the dough and if you are game enough, you may want to try.. How about using some red yeast powder if you are really looking for natural colouring alternatives. However, I am unable to advise you the ratio since I have never try it before. 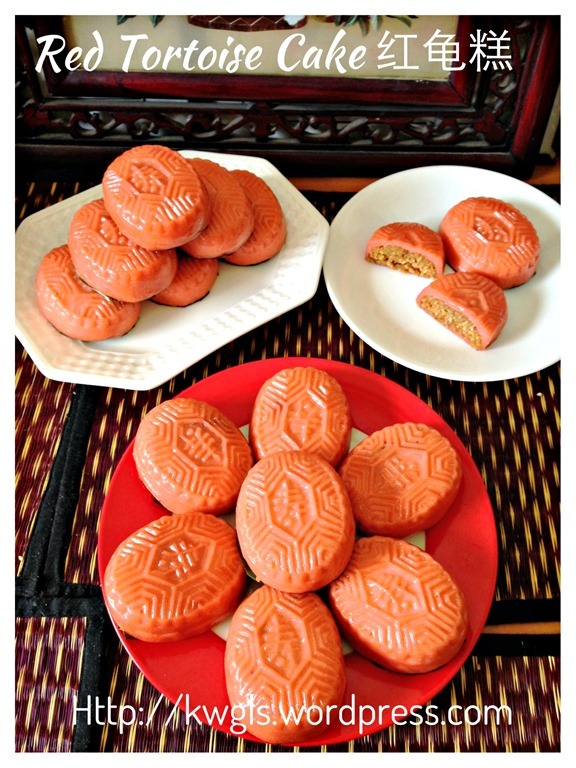 This entry was posted in Chinese and Asian Cakes and Snacks, Food Preparation Series and tagged 8, angku kuih, 番薯红龟糕, 红龟粿, 红龟糕, GUAI SHU SHU, Guaishushu, kenneth goh, postaday, red tortoise kuih, red tortoise steamed cake. Bookmark the permalink. 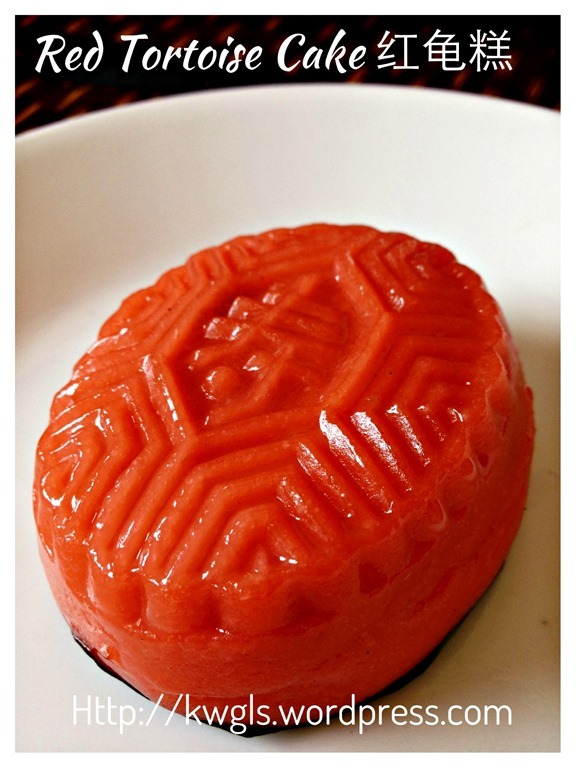 May I know where do you buy that angku mould ? I can’t find it overseas. 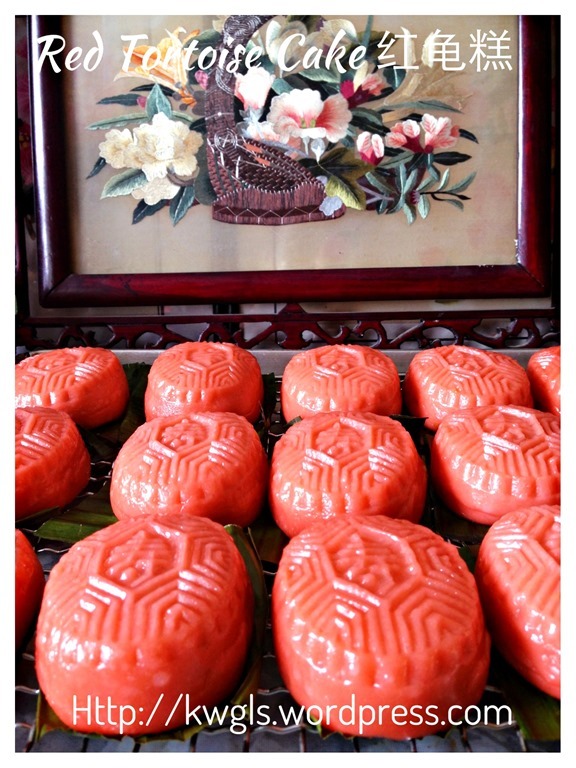 Ben, i bought it in Singapore bakery shop. There are many choices and sorry that you can get hold of that. 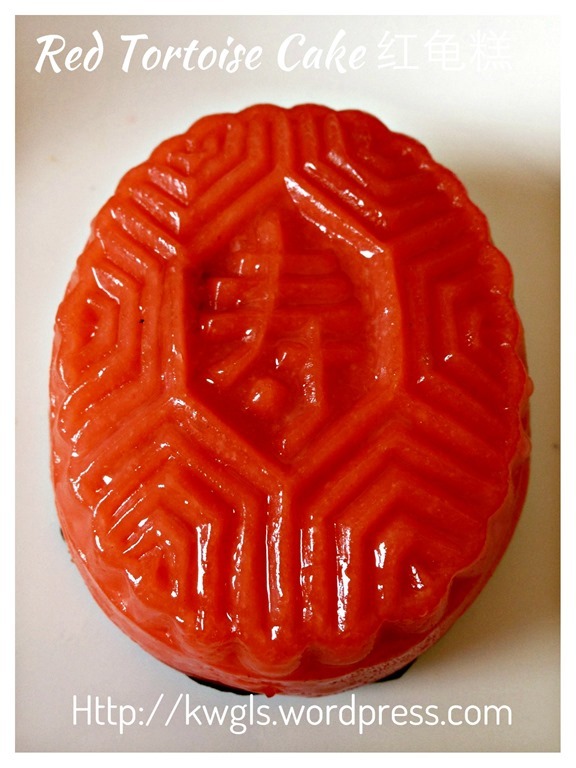 Why don’t you just shape it round without the mould? 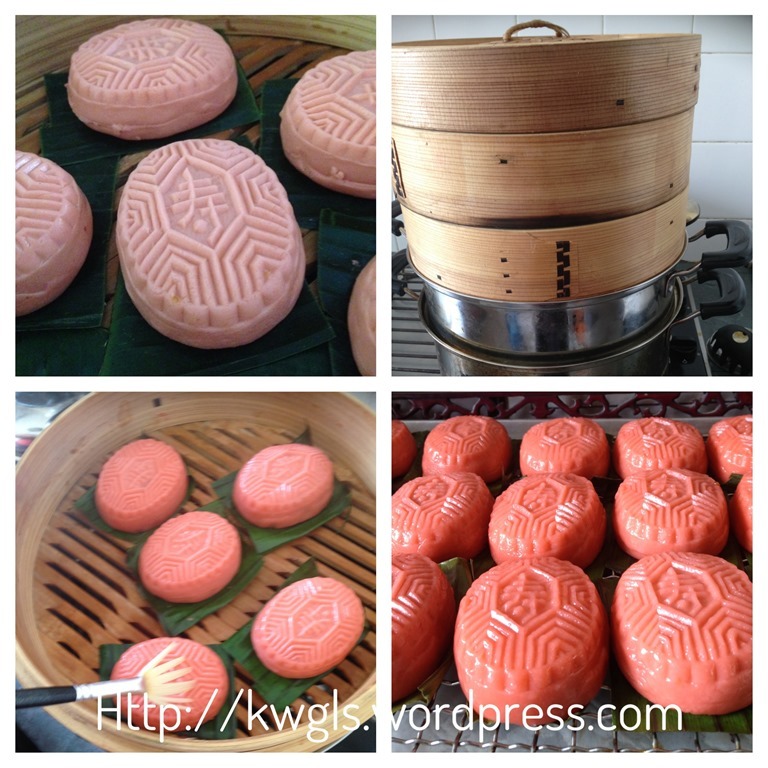 Hey, why my ang ku kueh print not clear after steaming? i didnt use low flame, is it due to this reason? Can I have the recipe for the angku skin with the exact amount? Thanks. Thank you so much for your reply. You are an awesome cook. I love all of your recipe. I don’t know if I am asking a silly question, but I still wanna ask maybe you can enlighten me in this area. Awaiting for your most sincere reply. 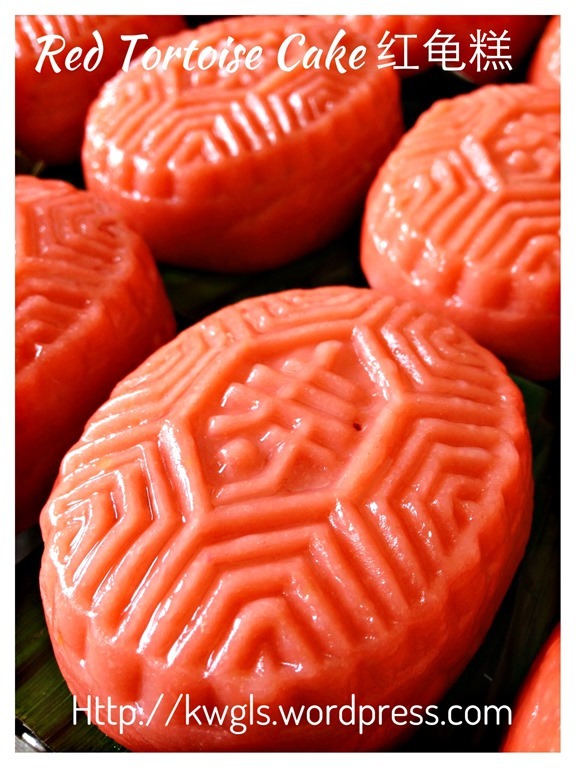 I had tried your any ku kueh. The results are Fabulous. My mom in law, even my cheeky girl give 100%. Thanks for sharing your recipe with me.